My youngest loves homemade baked beans and cornbread, possibly even more than he loves sloppy Joes. He'll eat them for three meals a day if I let him. 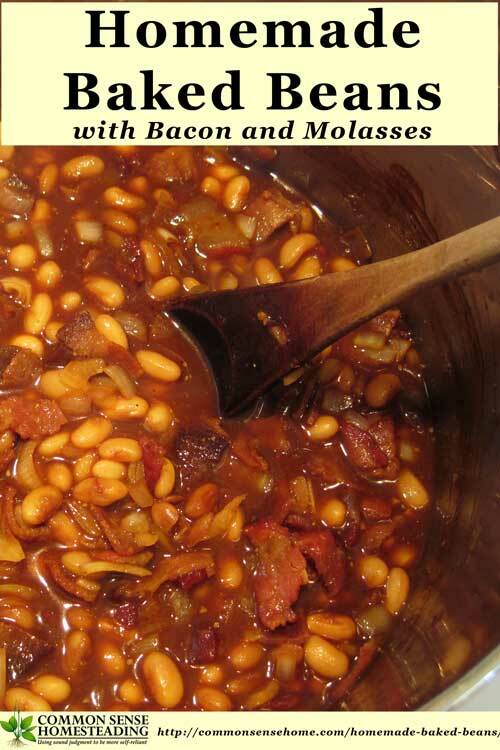 I like this recipe because of the earthy molasses, bacon (can't go wrong with bacon) onions and garlic (don't skimp on the onions, and use fresh garlic if you can). It's a simple recipe but really tasty. Place dried beans in a large bowl and add enough water to cover by 2-3 inches (about 8 cups). Let the beans soak overnight. (I put them in my 8 qt stockpot). Often I'll use a mix of dried beans from the garden for a blend of different textures. Drain and rinse the beans. Simmer beans in a heavy bottomed stockpot or Dutch oven with 8 cups of water and 1/4 cup of apple cider vinegar until tender, about 1 to 2 hours (longer is fine, especially if your beans are older). Don't boil, as this may make your beans tougher. Drain and set aside, reserving 2 cups of the cooking liquid. Preheat oven to 350° F. Using a large, heavy pot or Dutch oven, cook the bacon until crisp, 7 or 8 minutes. Add the beans and all other remaining ingredients and bring to a simmer. Add some of the cooking liquid if the mixture is too thick. Note: If I've got the beans already in one pot on top of the stove, I'll cook the bacon and onions separately and then add them and everything else to the bean pot. Transfer pot to oven. Bake uncovered for 2-3 hours (or to desired thickness) until the beans are tender, stirring occasionally. We've got a bake oven in the top of our masonry stove, so during the heating season I bake the beans in there in a stoneware pot. It gives them extra smokey goodness. When it's not heating season, I bake them in the regular stove in my Food Network 5 Qt Dutch oven. I tried a thinner enameled pot, but a thicker pot works better because there is less risk of scorching. I like to cook them until they're nice and mushy, but they don't look as pretty in the photos. Our masonry stove. The bake oven is that smaller door toward the top of the stove. The lower door is the main fire box. I hope you and your family enjoy a little beans and corn bread, too. 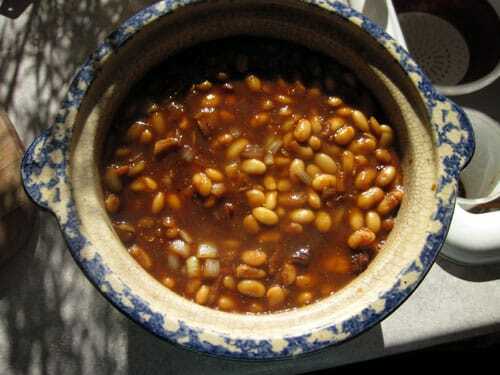 Place dried beans in a large bowl and add enough water to cover by 2-3 inches (about 8 cups). Let the beans soak overnight. (I put them in my 8 qt stockpot). Simmer beans in a heavy bottomed stockpot or Dutch oven with 8 cups of water and 1/4 cup of apple cider vinegar until tender, about 1 to 2 hours (longer is fine, especially if your beans are older). Don't boil, as this may make your beans tougher. Using a large, heavy pot or Dutch oven, cook the bacon until crisp, 7 or 8 minutes. Add the beans and all other remaining ingredients and bring to a simmer. Add some of the cooking liquid if the mixture is too thick. Bake uncovered for 2-3 hours (or to desired thickness) until the beans are tender, stirring occasionally. Originally publish in 2012, updated January 2016. Great recipe! Could I do this in a crockpot? I don’t see why not. If you try it, could you leave a comment to let folks know how it worked? 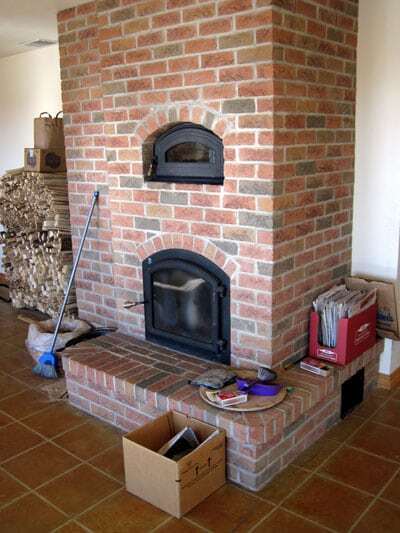 Wow, we’ve got the exact same masonry heater with bake oven. I’ve only cooked in the oven a few times because it tends to fill with ashes. Does yours do that too? I called the company (TempCast) to complain and spoke to the owner. He was excited that we had such a good draft, but had no concept that the oven filling with ash might just not be a good thing. Men! Laurel – I do indeed get a fine soot layer in the bake oven, which must be cleaned before using (at least a little). I love the flavor it gives, but it is a little tricky to time the burns just right to give me the temps and the cooking times I need. The beans are the most forgiving, but take the longest to cook. I’ve also made pizza and bread. I have a recipe simular to this that also has kidney and butter beans plus 1/2 pound ground beef. I have been wanting to switch from using canned beans to dry and that is how I stumbled across your recipe. Thankyou for the post, you have just saved me a bunch of experimenting. I have made the baked beans in a slowcooker, but the don’t have the same flavor as in an oven and they don’t thinken as well. 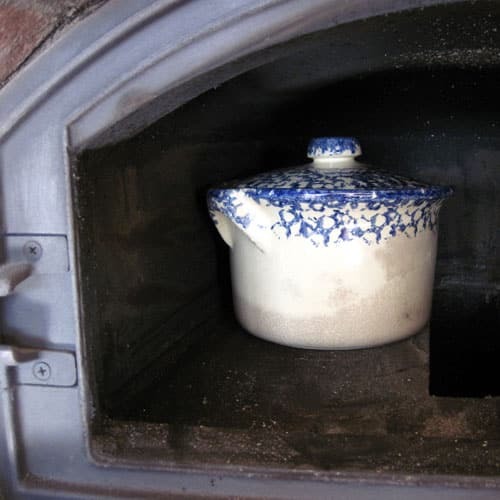 I don’t have a wood cookstove like yours (someday) but I do use a dutch oven while camping on when the power is out, or there is just too many things for the oven in the kitchen. 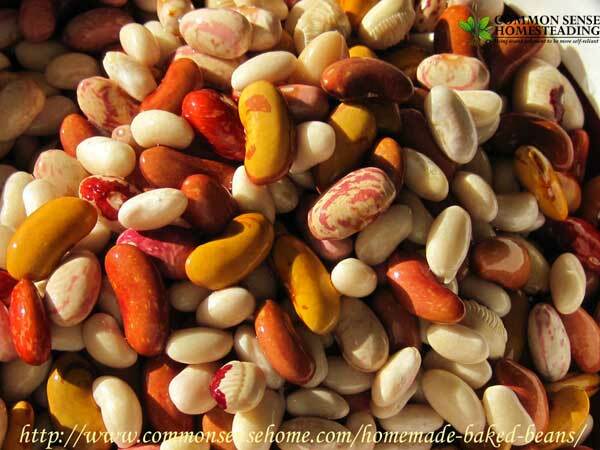 Homemade beans have a much richer flavor, and dry beans have a great storage life. could these be canned after baking or would they become mushy? I think they’d get mushy because of the extra cooking time and pressure. They do freeze well, though, if needed. They are very massive, so the foundation needs to be strong enough to support the weight of the stove. I think the Tulikivi units (http://www.tulikivi.com/usa-can) may be a little easier to retrofit, but very pricey. It is nice to have a big, warm beast that sleeps in the basement. I love the masonry oven. I need to put one of those in our basement. How do you add the onions in with the beans? I didn’t see that in the recipe. You can either brown off the onions in the bacon grease and then add them to the beans with everything else, or just add them to the beans with everything else. Instead of using bacon I put some slices of fatty salted pork and avoid adding more salt in the recipe. If the salted pork is too salty let is stand in water for over night and rinse. I also put maple syrup instead of brown sugar. Using what you have on hand makes sense, and I’m always a fan of maple syrup. Can the beans be baked in a cast iron DUTCH OVEN? If you got caught using ketchup in baked beans in any of the New England states you would be lashed to the mast during a Nor-Easter. That means yellow eye beans as the first choice. I generally use two pounds of dry beans at a time. Soak the beans over night, drain, and put into a large stock pot. Add water to cover the beans by two or more inches, bring to a boil and simmer until tender. Tender is when one blows on a bean and the skin splits and curls. Drain the beans, but reserve the cooking liquid. Pour beans into a six-quart slow cooker. Add back enough cooking water so that the beans are just covered. Start cooking on high. Score a slab of salt pork, the more fat the better. Simmer pork in plenty of water for 15-20 minutes to pull the salt. Drain and discard the water. Chunk up the pork and push into the beans. Peel a large onion, cross-score all but through, and push into the beans. Mix together one half cup of molasses and one half cup of maple syrup, formerly known as B. Add one teaspoon of ginger and one teaspoon of #2 dry mustard, although regular dry mustard is fine. Mix with enough reserved cooking water to blend well. Pour into beans. Cover crock pot and go to bed. The house will smell so good in the morning, that you will eat some of the beans for breakfast. Don’ forget to add some ginger! And Jacob’s Cattle beans get my vote as the very best baking bean. Easy to raise, too. I’ve been thinking of doing a big pot of beans for a barn-celebration party we’re having in a couple of months–wondering if I can do them in an in-ground bean hole. Anyone tried that method? As long as you have enough heat, I would think that it would work. My hubby is not a big ginger guy, but if you like it, go for it! One thing I’ve learned with sharing recipes online is that everyone has their own favorites and traditions and palates vary HUGELY from place to place. Just wondering: I am trying to learn to do without any pork. What would be a good source for the flavor and the extra content instead of bacon or any kind of pork? I LOVE bacon, but have decided that for me, eating it is not ok. …Nothing tastes like it, but I must find a replacement!!! There is beef and turkey bacon. I trust the beef more than the turkey, as I can’t see where on a turkey they’d find a cut of “bacon”. If you want to skip bacon entirely, you could use a drop or two of liquid smoke to get some of the same flavor, or some other finely diced smoked meat. Hi Laurie…….Love this recipe and sure hope your back gets better….FAST! I know your pain. I own/operate a house cleaning service and one of my clients gave me the following recipe. (I have since spotted one similiar online BUT “John” had tweeked his and I think it works…my dh likes them and he will NOT eat “just anything”!)….lolol. I generally use 2-1 pound bags of beans for a 7& 1/2 quart slow-cooker. ….perfect fit. 6. Add Beans to crock pot & add enough water to cover by 1-inch…. 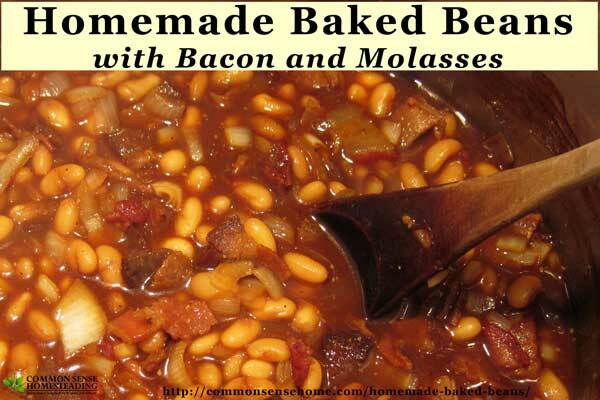 7.Arrange bacon, cut into 1-inch pieces on top of beans, cover with lid…. 8. Cook on HI until it comes to a boil, then turn to Low setting….Leave on low for 6 hours, stirring about once per hour OR two…. 10. Cover again & cook on low for 4-6 hours OR as long as you can stand the wait….Continue to add water to keep beans just covered…. 11. Beans should be soft(usually split) when done…. 12. Add weiners IF you insist!……blasphemy!!!!!! oooooops! I added that I use 2 bags of beans BUT forgot to add that would mean the rest of the ingredients listed would then need to be doubled up on…….sorry! lol – I agree on the weenies! Range of motion is much improved today, as is pain level. I’ve been working on presprouting some seeds and getting others started. Sitting is the worst! The boys brought in more wood since it’s supposed to get cold again this week, and dug up the last of the parsnips today. Sounds like the beans my mom would make. She’s been gone about 10 yrs now but thankfully all us girls (3) all learned how to make her baked beans. Of course, none of them tasted as good as moms. Her recipe pretty much matches yours except for the measurement of ingredients. And she added green & red peppers to her and during the summer she would add BBQ sauce. As I’ve been trying to do things more naturally for my family, in my web surfing, I have discovered your site. I love it so far! Any help you could give, would be greatly appreciated. Thank you in advance. There are a couple of reasons baked bean recipes have added sugar. One is to balance the flavors – savory plus sweet generally works well for most flavor palettes. Sugar is also added to help get that deep caramel color as the cooking progresses. That said, it’s your food – go ahead and add as much or as little sugar as you like! Try cutting the sugar in half or using 1/3 as much, or using only molasses instead of brown sugar if you’re skipping refined sugar. If you are watching carbs and not just refined sugar, beans may not be a best option, since they still contain a lot of starch. This recipe is delicious….we took the ingredients on our camping trip and made it in a dutch oven over coals….I did it for about 4 hours on a “low” heat. (10 briquettes on the bottom, 14-16 on top) at first, I would rotate the oven every 45 min, but as the liquid cooks off, I rotated every 15 min and stirred every once in awhile. I added a whole green pepper to the recipe….oh my goodness….it was DELICIOUS….I am making them again for a cookout tomorrow at a friends house. This time, I am putting them in the dutch oven and then in my home oven to have the awesome flavors you get out of cast iron cookware…. I put very little salt in it, just enough to bring it all together.